Inside the body, energy runs through organs and all tissues. Inside the body, energy runs through organs and all tissues. The pathway where energy runs is called meridian channels (经络). 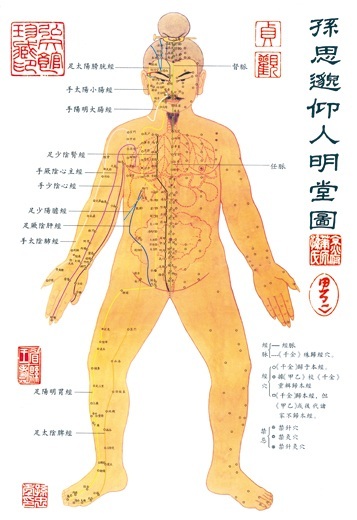 The main meridian channels within the body are the 12 organ meridians channels (十二经脉) and the 8 special meridians channels (奇经八脉). Along the meridian channels are the acupuncture points (穴位), which represents the gateways to meridians and internal organs. Acupuncturist and massage therapist stimulates these acupuncture points to restore balance of the specific meridian channels and/or organs. Apart from channels and points, there are energy centers (丹田) along the center line of the body. These are the places where energy is stored, regulated, and released. Some of the energy centers are: top of head, center of brain, throat, heart, stomach belly, and pubic base. Daoist Alchemist base their practice on these energy centers in different stage of their energy cultivation.